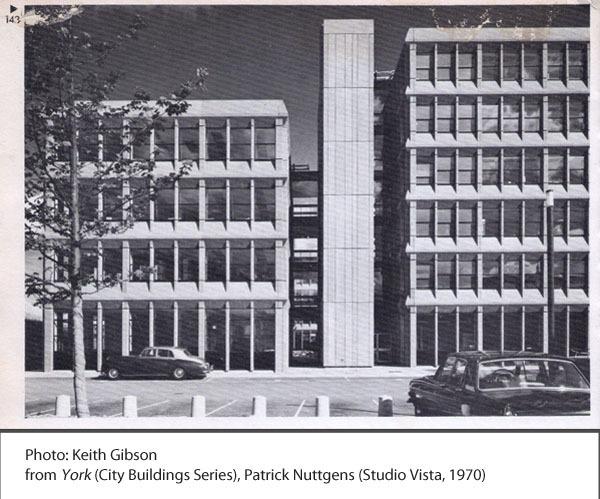 I know you were all thinking, reading the earlier page on Holgate Villa, ‘But what about Hudson House, my favourite 20th century office block?’ Okay, perhaps not. 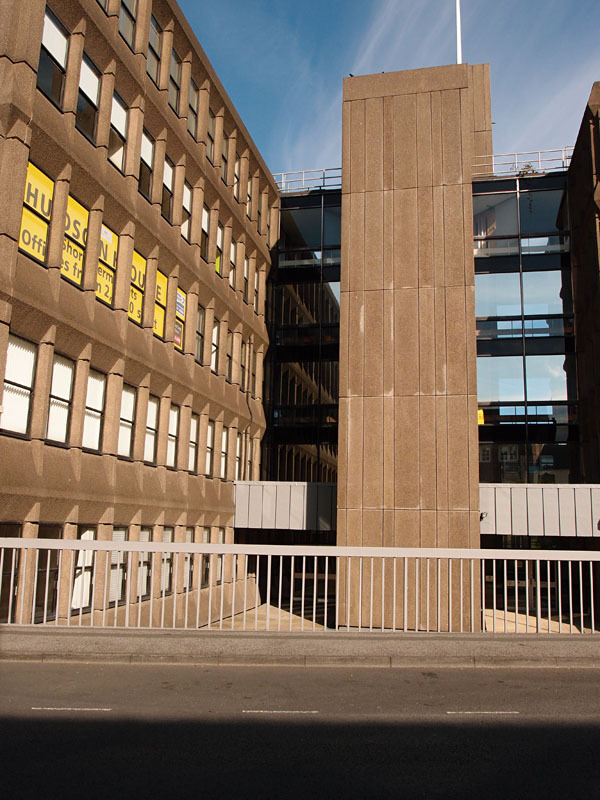 It is however an interesting building, part of the city’s recent history, and in recognition of that I’ve gathered together a few 1970s/1980s descriptions and responses to it, below. But let’s start with a photo taken this year, in August. There’s a planning application, still open for comment at the time of writing, to convert this to … yes, residential accommodation. As with Hilary House and Holgate Villa and perhaps, at some point, Ryedale House. Some years ago I had an email about this building from someone who wanted to research its history. Clearly it doesn’t have a long history, it’s about as old as I am, but I helped as much as I could, and hoped I’d hear back. As is so often the case, I didn’t. So I can’t tell you whether in fact this building won awards as my correspondent wondered. I can tell you that it looked photogenic in the bright sunlight of a summer morning. But then most things do. It’s another of those massive office blocks, and like Holgate Villa it’s a British Rail building, or rather, was. Purpose-built for BR staff. 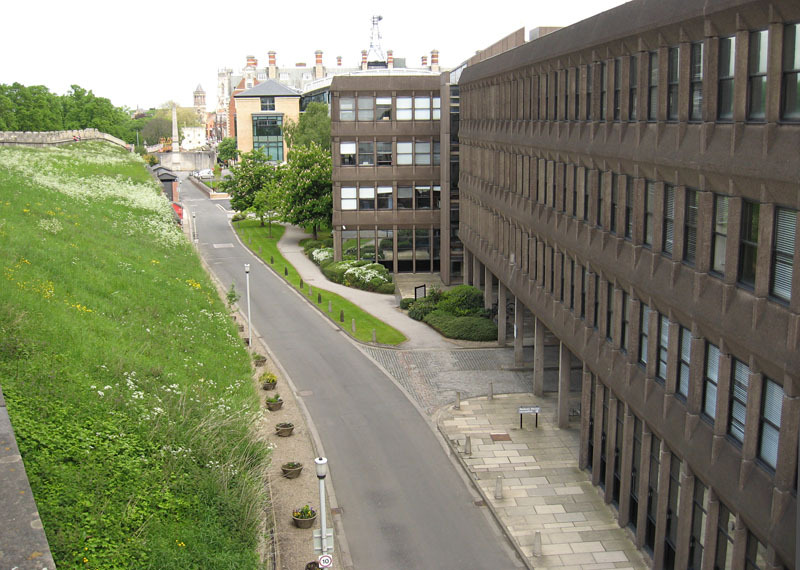 BR had so many office staff here in York in the mid to late 20th century. Often forgotten, in the recent emphasis on the chocolate industry, that so many residents worked for the railway industry, not only for the carriageworks but also many hundreds (thousands?) in the railway offices. It may soon be occupied by people making it their home rather than carving out a little space for themselves on an office desk. It’s a building in an excellent location, and no doubt with excellent views too. It’s near Micklegate, which would benefit from having such a large increase in the number of local residents. It also has car parking space. 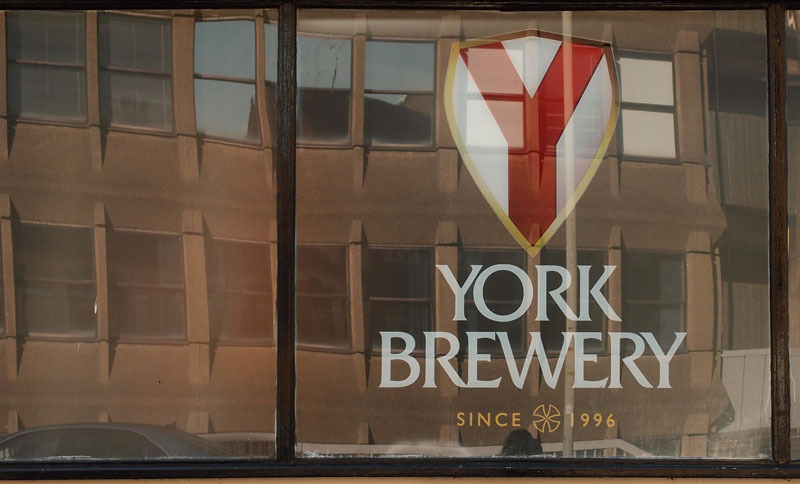 If all that wasn’t enough to make it a potentially desirable place to live, fans of beer may be interested to know that it’s also right opposite York Brewery, on Toft Green. It’s shown here reflected in the windows of that building. And here in its wider setting, in Toft Green. We’re perhaps more familiar with it from the other side, from the walkway of the city walls. And it’s from the walls that I remember this building, really well, going back 30+ years to the early 1980s, lunchtimes from school, when we sometimes wandered along here on the wall walk, and could see all those men at their desks. A lot of them, as I recall, seemed to be staring out of the windows, from their desks. Now, of course, we don’t need to look out of windows when we’re bored, we can look at Facebook and Twitter instead. A different kind of window on the world. But let’s go back to those pre-internet times, via a few extracts from books published in 1970-1980, when this building was quite new. What did they think of it then, I wondered. My small library of books bought at secondhand bookshops gives some insight. Hudson House all new and apparently white/pale grey, a year or two after it was built. Compare with my 2014 photos above. I’ve sometimes wondered whether its present colouring is a natural weathering or whether it’s had some kind of treatment in the intervening years. It looks surprisingly brown now. In the accompanying text, from this book published in 1970, Patrick Nuttgens sounds quite impressed by this ‘well designed modern building’. An interesting perspective from 1975, from John Harvey. ‘Massively repetitive’ and ‘horrifying in its likeness to an inspection hive’. John Hutchinson thought it ‘one of the most successful of York’s new buildings’. 115 flats planned for city-centre offices (The Press, 12 Nov 2014). The comments are also worth reading. 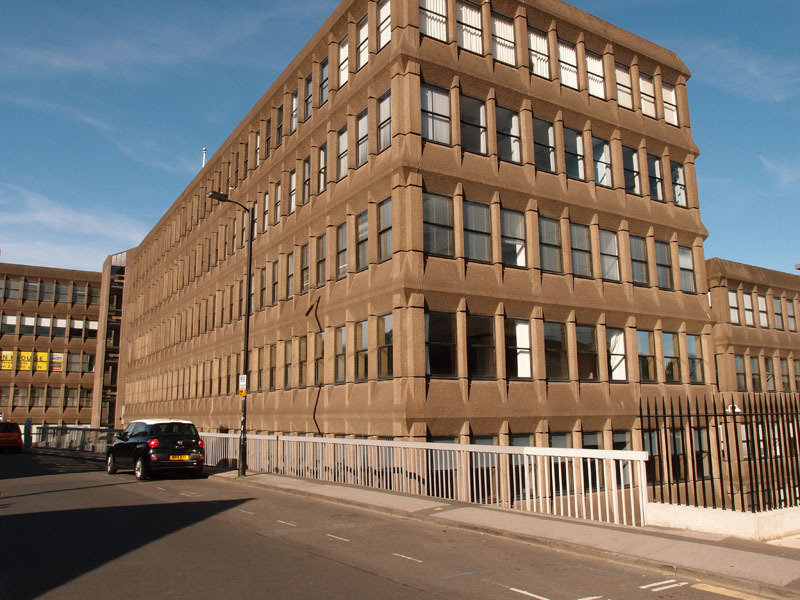 Note that the building, like Stonebow House, is referred to as a listed building in one comment. Like Stonebow House, it isn’t. Where do these myths originate, I wonder. 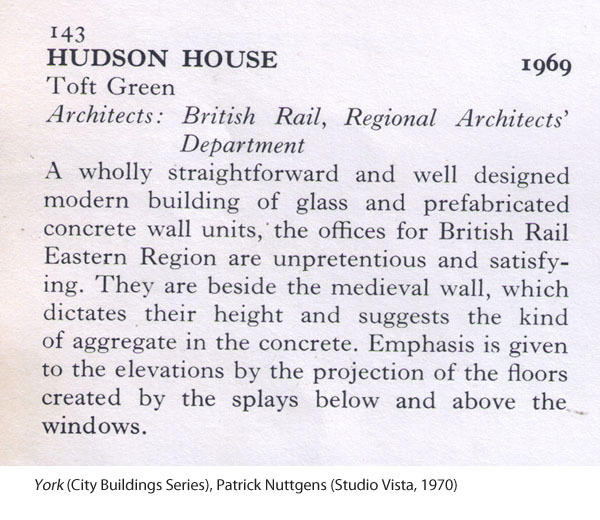 I hadn’t realised that British Rail had been responsible for both George Hudson house and Holgate Villa. They are both pretty awful looking buildings, with George Hudson house presenting even more of a contrast now the West Offices have been renovated so successfully. 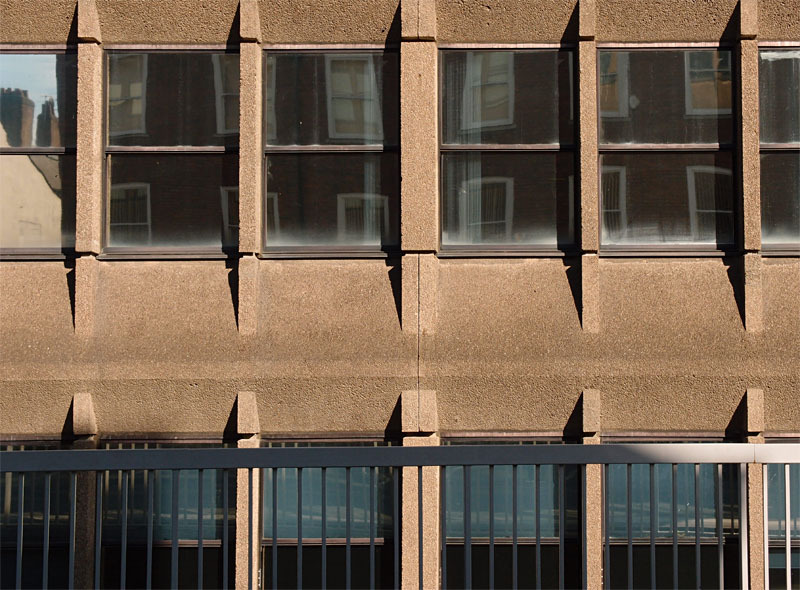 However, I would rather they were recycled into housing than knocked down and replaced by yet more hotels – George Hudson house’s most recent neighbour is a case in point – not exactly a brilliant piece of architecture. I’d bet on the colouring being natural – it’s similar to the concrete used in the path in my garden, which is white when pressure-washed and takes about a year to turn the same shade as these offices. Part of the trouble with fresh, modern, clean buildings is that they’re only modern so long as they’re fresh and clean – algae, stains, dirt, weathering all turn them into dated eyesores. The problem with turning chunks of town centre into flats is that they’re effectively dead during the day – whereas even an office has a certain amount of life. 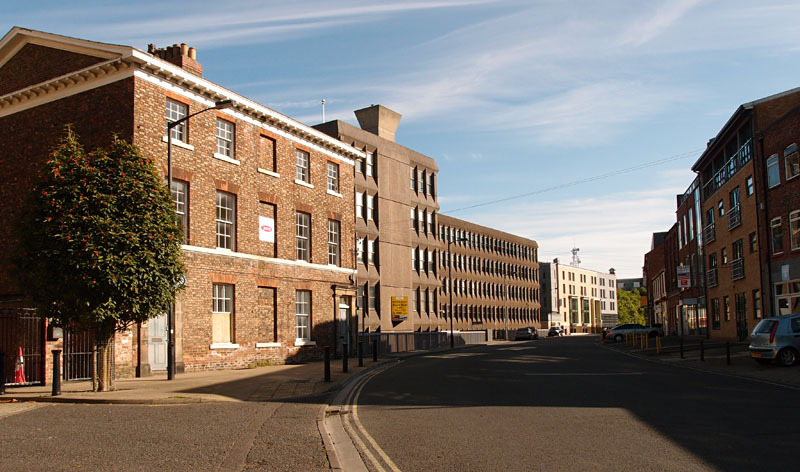 I’d be all for demolishing the offices and turning the area into mixed residential/light industrial units (breweries, garages, workshops – anything with a bit of noise and motion during the day). 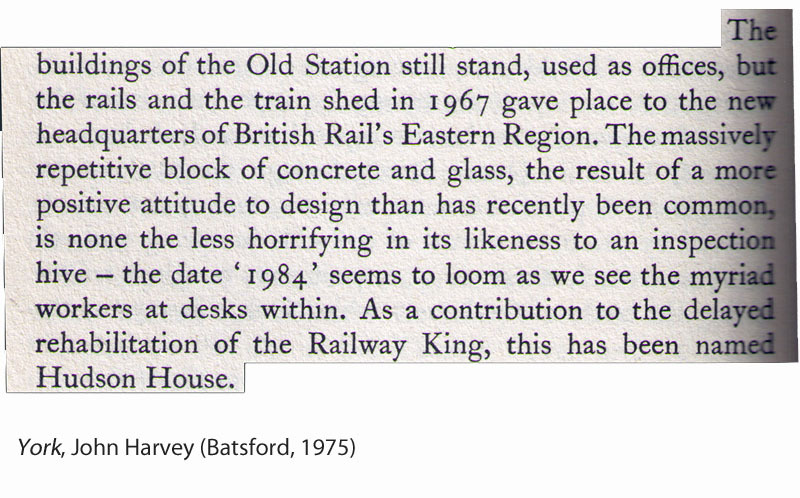 My father, Michael Wall was an architect in this building when the British Rail architect’s office used it. He overlooked the bar walls and I recall visiting him at his desk as a child. My Mum remembers that there was a design fault in that they hadn’t put any drip stop above the windows so rain streamed down the building and straight across the windows carrying with it dirt and dust leaving the windows filthy. August 2018 – the eyesore that was Hudson House is currently being ripped down by a troop of JCBs. Us workers in George Stephenson House next door can see the top of the Minster for the first time ever ! I used to work in HH – not sorry to see it go, was always a cold and depressing building.